Join the 8th Annual Vientiane Career and Education Fair, at Don Chan Palace, on July 7th and 8th. In this fair, everyone will have an opportunity to meet and discuss your career and future plan with big companies, international organizations and overseas university representatives. FREE ENTRY!!! As many as 18 entertainment venues will have to move from their location near the National University of Laos after they were deemed to be a distraction to students. What Languages Are Spoken In Laos ? Lao, also called Laotian, is the official as well as the dominant language in Laos. Migration and conflict have resulted in the present ethnic composition of Laos and to the geographical diffusion of its ethnic groups. 86 languages have so far been documented in the country as used by its various ethnic groups. French and English are identified as minority languages in Laos. Education authorities will allow all privately owned educational institutions countrywide to submit adjustments to tuition fees charged for the academic year 2017-18, aiming to seek uniform sector-wide measures and avoid ad hoc or unduly steep increases mid year. Students, teachers and administrators of state and private colleges and other educational institutions await official confirmation on whether courses of study can be accredited towards Bachelor and higher-level degrees for the coming academic year. Team BUG5, a group of three young innovators from Laos has earned the nomination to represent Laos in the South East Asia Regional Final Round of 15th Microsoft Imagine Cup 2017, Microsoft’s global accelerator program to empower the next generation of computer science students. They will make history as the very first Laotian team to get qualified for Imagine Cup regional finals. A trainer was killed and 26 secondary school students suffered minor injuries in an explosion accident yesterday morning during a military-tactics training drill at a secondary school in northern Oudomxay province, a police officer said. The tragedy happened as the trainer, Military First Lieutenant Somphone brought both real and fake grenades to the training course held at a secondary school in Xay district. The trainer accidentally took …. The construction of the new campus of the Joshua Hoffet French School (Lycée Français Josué Hoffet), which shall serve as an upper secondary school, was commenced on Wednesday in Hadxaifong district of Vientiane. 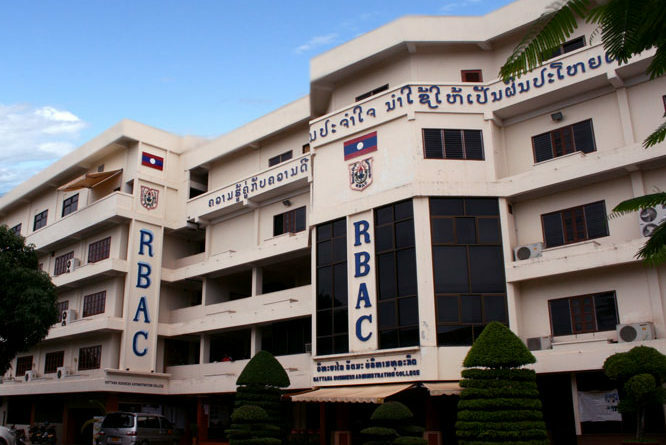 Some students in Lao universities and teachers in central Laos are feeling a financial squeeze as scholarship students are facing increased fees while some high school teachers are still waiting for paychecks, RFA’s Lao Service has learned. Students in pedagogical college and the Souphanouvong University in Luang Prabang province are questioning why they are being required to pay the fees while they are on …. All schools and state or private education institutions in the four main districts of Vientiane including the National University of Laos will close temporarily during the 28th and 29th Asean Summits back-to-back from September 6-8. The Ministry of Education and Sports recently announced that all classes …. Most of these small family businesses along the roadsides sell about …. Some primary schools in Laos have started offering English lessons. 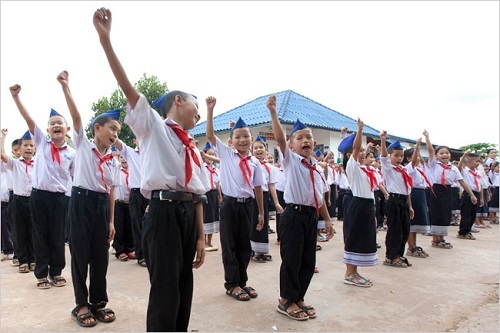 A group of primary students in Laos feels very excited and happy to learn English for the first time. The sounds of the ABCs and laughter can be heard from a long distance away. In the small classroom with concrete walls and a zinc roof, a young teacher can be heard instructing her pupils to read as …. The Ministry of Education and Sports has indicated that it will allow 24 qualified institutions to resume their bachelor degree courses for the 2015-2016 academic year after they met the standards set by the ministry. A senior official from the ministry said the biggest problem facing the institutions was the lack of sufficiently qualified teaching staff. The institutions that are expected to resume their bachelor degree courses this academic year are as follows: …. Thailand has launched its first ever “science caravan” to Vientiane in a bid to provide Lao students with scientific and technological knowledge. More than 500 Lao school and university students attended the opening of the event and took part in scientific activities and experiments, guided by Thai officials who joined the touring exhibition. Thailand is ranked 87th in the world in the World Economic Forum (WEF) Global Competitiveness Report 2014-2015 – behind most other member-countries of the Association of Southeast Asian Nations, including less economically developed neighbours such as Laos, which is ranked 60th. This is both embarrassing and …. While the latest batch of National University of Laos graduates celebrate their achievement, they are faced with the sobering reality of low prospects in immediate employment. The number of new graduates this year stands at 8,162, adding to existing graduates who have already joined the job market. The Laotian Ministry of Education and Sports and IIG Education are working together to boost English-language proficiency and information-technology skills among teachers and students to international standards. The Ministry of Education and Sports will recognise TOEFL primary for use in the current English proficiency assessment system for primary school students in Laos. The ministry will also approve TOEFL junior for use among lower secondary students, and TOEFL iBT or TOEIC for assessing English proficiency of higher school students aiming for admission to foreign …..
Like many other young Laotians taking Chinese classes, Mr. Ratthida, 19, is learning the language in the hope of working for Chinese companies, which are investing heavily in …..
Thailand ranks near the bottom in an English proficiency survey, showing the persistence of one of the key competitive weaknesses of the Thai economy. Out of 60 countries and territories where English is not their mother tongue, Thailand manages only 55th place – outdoing only Panama, Kazakhstan, Algeria, Saudi Arabia and Iraq, according to the EF English Proficiency Index. Laos is not included in that listing. Poor English skills indicate the small base of competent adult English speakers necessary for a globalised workforce. The survey was conducted in the realisation that English is now a ….. While Laos has made steady progress in education reform, universal primary education may not be achieved by 2015 as targeted due to the high dropout rate. According to a recent joint report by the government and the United Nations, Laos is close to achieving the targeted 98 percent net enrolment rate for girls and boys but the overall efficiency of the education system remains low. Primary schools have significant numbers of over-aged and under-aged pupils because of early and late entries and grade repetition. The survival rate to grade 5 has improved from just 48 percent in 1992 to 70 percent in 2012, but it is still low compared to other …. Private colleges and institutions have expressed fears over their long-term financial viability after the government banned bachelor’s degree course intakes outside public universities until 2014-15. The new academic year for the private education sector began this month but uncertainty around the future of college courses has seen a substantial drop in enrollment numbers, causing financial pressure. Under the government’s policy, announced earlier this year, all students already taking a bachelor’s degree at a private college can …. Laos is suffering from a high rate of teenage pregnancy, with four out of ten women pregnant or already having given birth to their first child by the age of 19, according to a press release from the United Nations Population Fund (UNFPA). In Laos more than 60 percent of the population is under 25 years old, and at least half of this group at girls. The UNFPA press release focused, in particular, on the high prevalence of teenage pregnancy in Laos. A recent survey in the country found that for every thousand adolescent girls aged 15 to 19 in Laos, there are ….. Wealth distribution remains a major challenge despite the government’s efforts to tackle the development gap since 2011. In the central region the figure stood at US$1,680 in the 2011-12 fiscal year, while in the north and south of the country it was US$985 and US$1,060 respectively, the planning ministry reported in its mid term report. The lack of transport infrastructure also makes it difficult for people in the north to access government services such as healthcare and education, which are essential for …..